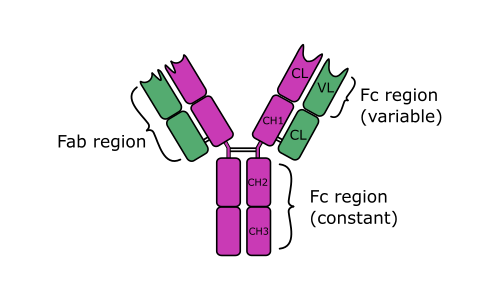 IgD (IgD) is a monomeric antibody isotype that is expressed in the plasma membranes of immature B-lymphocytes. IgD is also produced in a secreted form that is found in small amounts in blood serum. Secreted IgD is made up of two heavy chains of the delta class, and two light chains. IgD's function has long been a conundrum and is still incompletely understood. IgD is present in species ranging from fish to human (probably with the exception of birds), indicating that IgD has been preserved since its ancient origins which suggests that IgD has important immunological functions. It is known that IgD signals for B cells to be activated in order for them to participate in the immune defence. Apparently IgM and IgD share this role, with IgM being expressed sooner in the life-cycle of B-cells than IgD. It is not well understood what the functional difference of IgM and IgD on B cells is. Knock-out mice models have not yielded any major intrinsic defects. In fact, heavy chains of IgM and IgD are encoded by a common transcription unit. IgM-/- mice show normal B-cell development and maturation, with IgD replacing membrane-bound and secretory IgM. These data suggest that IgD is largely able to substitute for IgM functions in B-cells. IgD apparently is also able to bind to basophils and mast cells and activate these cells to produce antimicrobial factors that are functional in respiratory immune defence in humans.